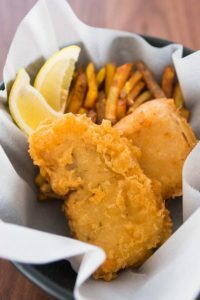 While fish and chips originally hails from England, Australians know that the dish is done best down under! The UK has a reputation for serving soggy fish with mushy peas and a heavy dose of vinegar, which is perfectly fine for those who like it that way. But for those of us who prefer a fresher and crispier version, Australian-style is the way to go. Cooked to perfection, fresh fish in a delicious beer batter is hard to beat. Pair it with delicious, crunchy chips, a variety of dipping sauces, and a water-side location where you can enjoy your meal, and you’ve got the perfect combination! Fish and chips are great all year round, but are definitely a summer favourite. Try our delicious fish and chips with a special family deal Mondays through Thursdays!